Her time period is cool. I LOVE her meet outfit. Seriously. My other two dolls have short-ish hair. Her boots are adorable. The little “buttons” don’t actually button, but that’s okay because they are super small. And they look like chocolate chips. The boots have little heels on them, which makes it difficult to stand her up in the grass or uneven ground. :p The boots have Velcro on the back, but they are challenging to put on over her socks. Her socks are white and almost knee-length. I don’t have much to say about them. Her drawers are white and lace trimmed. They are a nice historical touch. Her DRESS! XD I wish it came in my size! It is a gorgeous shade of blue. I think it’s close to Royal blue. It has a small pattern on it. There are also black bows and piping. It has cap sleeves, which is really cute. Addy’s hair is black, textured and a bit wavy when you take it out of the braids. She came with two French braids tied together with blue bows, but I redid her hair. I was a bit worried when I bought her that her hair would be tough to work with. Actually, it’s not a problem! You can just brush her hair with a regular doll hairbrush. The coarseness isn’t a problem at all, either. 🙂 She does have lots of flyaways, and her hair is longer on the sides than the middle. AG never has any pictures of Addy with her hair down, which is kind of annoying if you’re thinking of buying her. Her hair is REALLY LONG, as you can see. There are three pieces: a bonnet, a cowrie shell necklace and a patchwork bag. The bonnet is definitely my favorite! It frames Addy’s face so sweetly. The ribbon is sewn on very securely, which I’m grateful for. The necklace is on a plain black cord, and is very significant in her stories. The bag looks like it’s patchwork, but it’s actually one piece of fabric. The interior of the bag is the same fabric as Addy’s dress, so if you wanted to have her dress match her bag, you could. You’d just need to cut off the tag, if you cared. The bag is a bit small. I’ve heard that she might be retiring, with Melody coming out this Summer. 😦 If you don’t want her to be retired, ask your parent if you can go to this website to help “save” her: https://www.change.org/p/katy-dickson-do-not-retire-addy-walker They’re halfway there! I think Addy’s time period, 1864, is very important for American girls today to know about. Do you have Addy Walker? What do you like and/or dislike about her? Hey guys!! I’m Gymnast03 and I’m going to review the knit blanket sweater. It’s inspired by Kaya. I love the print on this sweater. The colors are: black, white, pink, blue and red. It’s a high low hem. Its comfortable, stretchy and warm. But if you’re outside for a long time, or it’s cold or really windy, it might not be the best thing to wear because you might get a little chilly. I don’t think it is meant for an outdoors coat. I usually wear it with black or navy blue leggings or navy skinny jeans. The pants and sweater look great with a plain white or red shirt. On the right hand side, there is a Beforever button. Today I’m going to be doing a post that is not related to AG. ( I hope you guys don’t mind!) I was going to do a Christmas post with our cousins dolls and our dolls, and it was all ready, and everything was great and then… I forgot the camera. *Facepalm* But I get to review this Funko Pop! instead! If you guessed Rapunzel and Pascal, you’re right! Here they are outside of the box. Rapunzel is so cute! She has a paintbrush and is barefoot. My fave thing about her is defenitly her hair. So beautiful! The way it curls at the bottom is sweet. Now Pascal. He is really tiny, so I’m going to have to be careful to not lose him. I rate the set 5 out of 5 stars! Rapunzel’s detail is amazing, and Pascal is so cute! The only thing I would change is Rapunzel holding a frying pan. But the paintbrush is a rare nod to her artistic side! Rapunzel is my favorite Disney Princess. Who’s yours? Hi girls! I recieved Maryellen’s Birthday Dress for an early Christmas present, and Julia will be modeling it. It might be my favorite AG dress ever! It is gorgeous! It comes with a headband, shoes, and the dress. The headband is green with a side bow. The back of the dress. It velcros in back. A closer look at the bodice. The sash has a pink faux flower on it. The skirt has a sheer tulle-ish layer on top, and a silky layer underneath. The shoes are so cute! They are a bit lighter than hot pink, and have a white bow on top. The first picture shows the sides. I rate the outfit 5 out of 5 stars! Literally no complaints. One thing that’s nice about it is that it can be worn in Spring, Summer, and Winter. It is backordered on the website to February 26, 2016, but it might be available at a store near you! Here’s the review of Grace! She is SO BEAUTIFUL!! 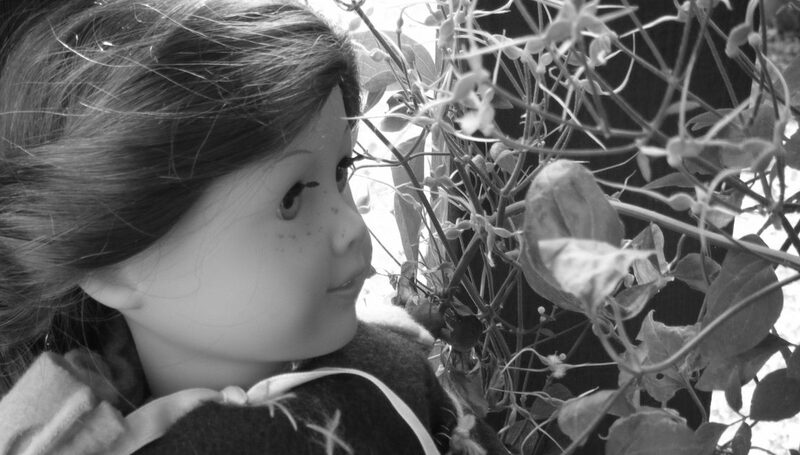 Her freckle pattern is different than any other dolls. The shirt says “Paris I love you” in French. The pink stripes are glittery. On th right sleeve there is the Grace tag. This is a very versatile piece. The skirt is pink with a black bow. It’s really cute, but very short. You could always put some leggings underneath. The boots are so versatile and cute! The bows are attatched to a strip of fabric that sometimes flips up, but besides that, no problems. (Sorry for the blurry pic.) Her eyes are deep blue, and her eyebrows are feathered. We didn’t get her ears pierced. There’s a small section of her bang that’s floppy. It can easily be brushed to the side, though. Now I’m going to compare Julia (Just Like You #23) and Grace. When Grace came out, I thought she was Julia’s twin. As the photo shows, this is not the case. First, hair. Julia’s is shorter and blonder. She also has no bangs. Their skin tones are totally different. Grace has very light skin. Their face molds are different. Julia has the classic, and Grace has the Josefina. Here you can really see the difference. Now for a few bonus pics! I rate Grace 5 out of 5 stars! The only things I don’t like are the short skirt and floppy bang. What do you think of Grace? Hey guys! I’m Gymnast03, and today I’m reviewing the fair isle pajamas. I LOVE these pj’s! I got them last year at AG place. The top has silver and pink snowflakes and little green stitches on it. I like the embelishments! I don’t really like the ribbed fabric though. I like everything about these pants!!! These are really cozy looking! There is dark pink fur on the top and a soft sole. The pink fur on the top is really soft! I love this outfit on Saige!